The United State’s National Renewable Energy Laboratory (NREL) and the Pacific Northwest National Laboratory (PNNL) are undertaking studies of biomass conversion technologies to identify barriers and target research toward reducing conversion costs. 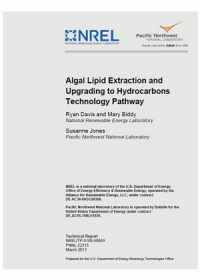 This technology pathway case investigates the cultivation of algal biomass followed by further lipid extraction and upgrading to hydrocarbon biofuels. Technical barriers and key research needs have been assessed in order for the algal lipid extraction and upgrading pathway to be competitive with petroleum-derived gasoline-, diesel-, and jet-range hydrocarbon blendstocks. This report is one of a series of case study reports undertaken by CSIRO as part of an international comparison of communication and engagement practices surrounding carbon dioxide capture and storage (CCS) projects funded by the Global CCS Institute. This case study is a retrospective view of the United State’s FutureGen project, which was initiated in 2006. FutureGen was created as a partnership between the US Department of Energy (DOE) and the FutureGen Alliance (Alliance) – a non-profit consortium of around a dozen coal companies and electric utilities with operations around the world. This report details the Alliance’s effort and the Illinois FutureGen Team’s community engagement activities and the perceived effectiveness of this engagement. The timeline is from July 2006, when the four semi-finalist sites were selected, through December 2007, when Mattoon, Illinois was selected as the final site, and ends one year later. 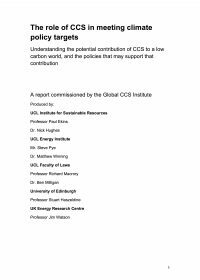 This report is an overview summary of a series of case study reports undertaken by the CSIRO as part of an international comparison of communication and engagement practices surrounding carbon dioxide capture and storage (CCS) projects funded by the Global CCS Institute. While there are key lessons around what constitutes best practice in communications and outreach, these alone are not sufficient to ensure successful CCS project deployment. The findings suggest that a project’s ability to adjust its planning and management to its social context is more likely to ensure a positive outcome for all involved in the project. A fundamental conclusion is that communication should not be seen as an add-on to the project. Successful projects integrate communication and outreach as a critical component of the project from the beginning. This case study examines the plan by BP to construct and operate a commercial hydrogen power plant with carbon capture and storage (CCS), in Carson, California. Carbon dioxide would be captured at the plant and piped to a location in nearby oilfields for enhanced oil recovery (EOR) that would result in carbon dioxide storage. The purpose of the study is to identify key lessons learned in communicating about future sequestration projects.